Really, Why do you want a BRT? Zil in the Working Group Ring at the 2012 Westminster Kennel Club. When David has scheduling conflicts and there is a show we want to attend, Shelby Roberts, Lenny Brown and Jamie Clute have handed Zil. All have done a tremendous job with him and he has found a home away from home with the Harpers. If he wasn't happy with them he wouldn't be out there. Through December 31, 2012, Zil was the #1 BRT in both Breed and All Breed competition. He has now taken the lead in AKC breed history of number of dogs defeated in breed since the Black Russian Terrier was accepted into the AKC in 2004. He is #2 Lifetime in All Breed competition. He has been awarded over 245 Best of Breeds and has faced and defeated all major dogs competing in the United States. He also holds the #1 Grand Champion Lifetime rank. the 2012 #1 Grand Championship rank and now the #1 rank in dogs defeated in breed competition in a single year. On October 19, 2012 Zil became the First Gold Level Grand Champion with over 400 Grand Champion points of only 2 current Gold. On December 16, 2012, Zil finished off the year with his second AKC Eukanuba National Championship. His impressive numbers speak for his structure (based on Breed Standard) and temperament which must be combined to make a great dog. Major Shows Competed in with Results as a campaigned special. 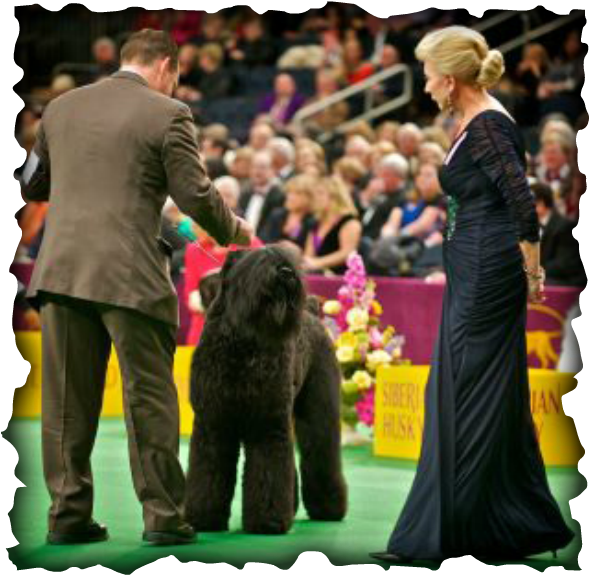 Zil is the ONLY Black Russian Terrier to have received major placement at EVERY major show he competed in.